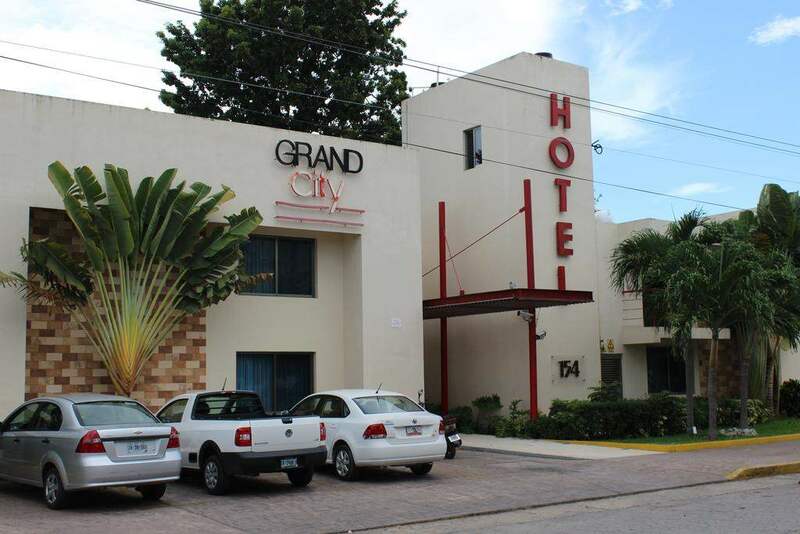 Grand City Hotel Cancún is in central Cancun, less than a 10 minute drive from the beach. 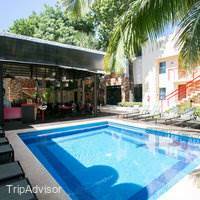 It offers gardens with an outdoor swimming pool and rooms with free Wi-Fi. 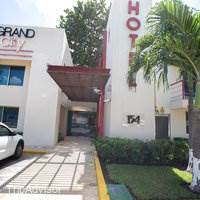 Grand City Hotel is within walking distance of supermarkets, bars and restaurants. 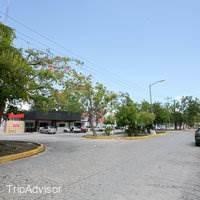 Plaza Hollywood Shopping Center is an 8 minute walk, while Plaza Las Américas Shopping Center is one mile away. 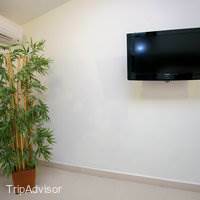 Each modern, air-conditioned room includes a flat-screen TV, a sitting area and a microwave, as well as a minibar. 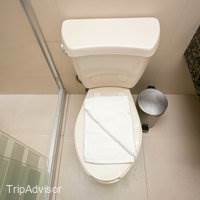 There is also a private bathroom with hairdryer and free toiletries. 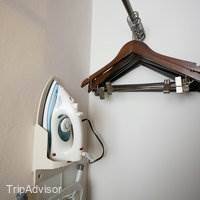 All rooms include other amenities such as a sewing kit, iron and coffee maker. 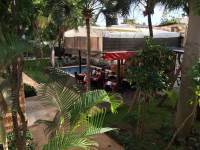 This hotel offers a cafeteria and a restaurant, and the pool area has showers and toilets. 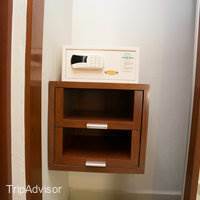 Guests can request tourist information at the 24-hour front desk. 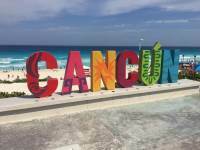 Cancun International Airport is 11 miles away. 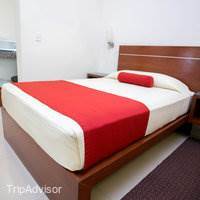 Very nice place to spend the night in the city, its only a 15-20 minute taxi ride from the airport (i recommend ordering an uber) Clean rooms and friendly staff. 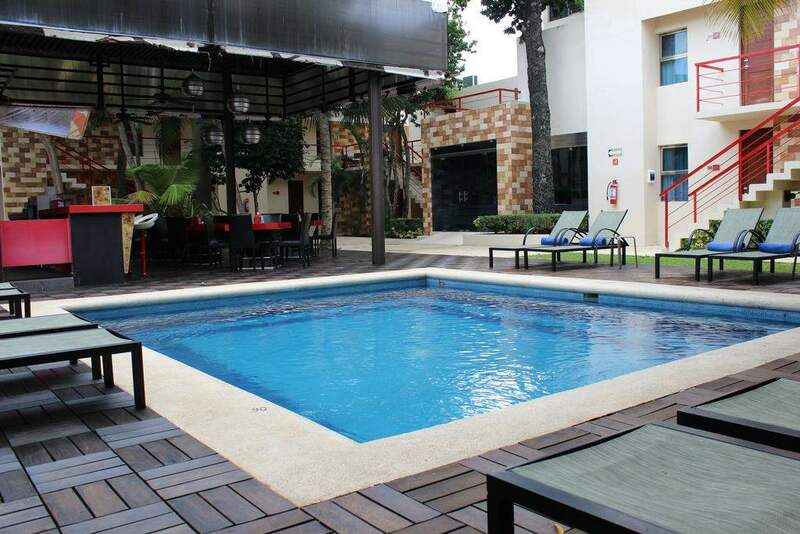 The pool and dining area is also very nice. Very neat and large rooms. Friendly staff! Anna at the front desk was so helpful and friendly. 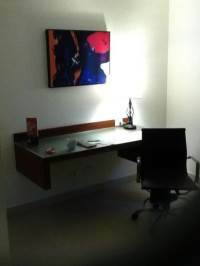 Rooms are very neat and large, the location is excellent! A walk to the ADO station and there are buses nearby to get you everywhere. And other reviews mentioned noise, I didn't experience any noise here. Great place to stay if on a budget. We stayed in this hotel 30/4-3/5 (3 nights)! Pros:1. 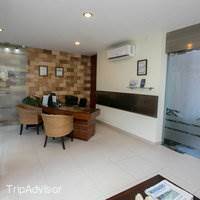 Good location : just around 10-15 mins walking to supermarket and some restaurants in down town and room charge was reasonable2. 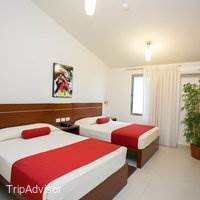 Very spacious room and rather clean room: we were 3 ladies shared a room with two double beds3. 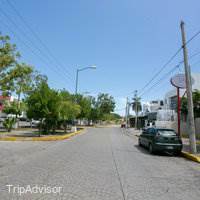 Very helpful and nice staff (Ana): she told us the best way from hotel to Puerto Juarez for visiting Isla Mujeres (taking taxi by ourselves, not call in hotel, just $35 peso per car) and even she helped bargain with the driver! Besides she had answered our many other questions! Cons:1. A bar next to this hotel: it made noise each day until midnight 0100 of 0200 which made my other friends not to sleep 2. 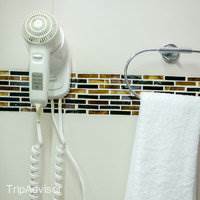 My room hair dryer didn't work but my friend brought one during the trip3. A male staff with glasses: his service really poor! Why? He told us to take a taxi (through hotel booking)to the point for scuba dive agency in hotel zone & the taxi costed us $360 peso with only 8 mins riding! That journey was shorter than that to Isla Mujeres! How come? I really doubted if the taxi booked by him had any connection with him! Even though moving to Royal Solaris Hotel in hotel zone, the taxi charged us $240 peso per car with half an hour journey! I was only able to stay one night, but this hotel far exceeded my expectations. 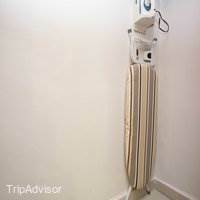 The room was clean and comfortable, the staff was very attentive. The only negative, which wasn't too bad, was the location. It was very difficult for both the taxi driver and then the Uber driver to find, even using GPS. I would return - now that I know where to find the property! Nice hotel in the city area (not on the beach). We arrived late and wanted to rest before a drive to Merida (3 1/2-4 hr away). And for that it's perfect. Rooms are large with simple decor. 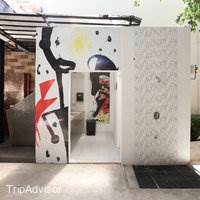 Small hotel with only 18 rooms and feels very personal. All rooms overlook a courtyard. 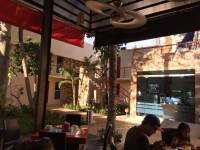 The courtyard area for breakfast is very pleasant and cool in the warm weather. 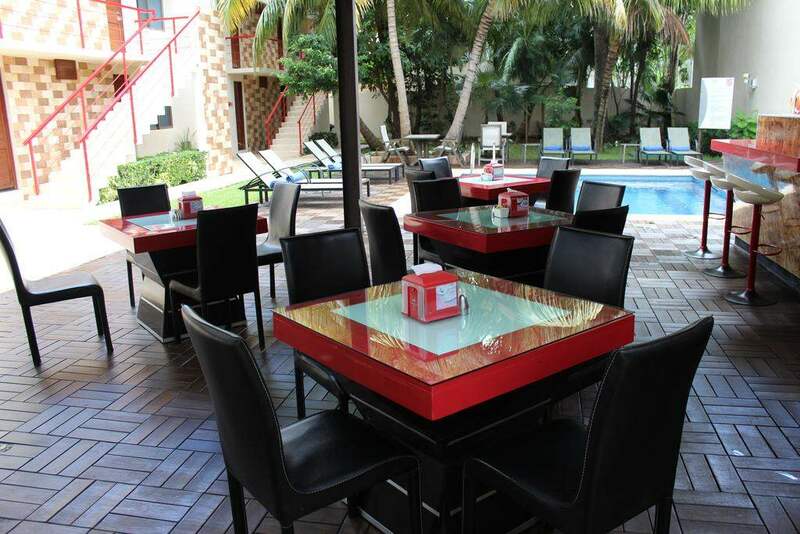 Several options to have breakfast (ask for huevos motulenos a typical Yucatán breakfast dish), and lunch. 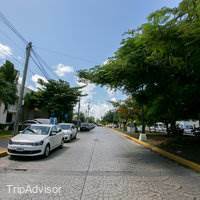 The food was very good (no dinner but several places within a block or two, the best is Cafe Andrade behind the gas station and Burger King to the right two blocks as you exit the hotel, can't miss it). A negative that it's across the street from the Red Cross and ambulances are in and out all night, and a loud bar next door (it was a Friday). So if you need absolute silence to sleep this is not the place for you. Overall a good experience. 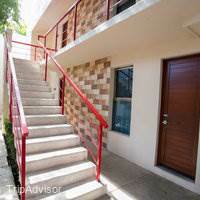 Clean, comfortable and great location (close to Walmart, markets and restaurants). 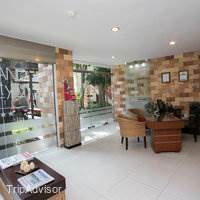 The staff was very friendly, professional and helpful. I heard a little bit noise from a nearby bar in late evening but my whole family, including seniors and yong kids, was OK with that.Overall I highly recommend this small but well managed hotel! Noisy rock bar next door. Outdoor loud live music from midnight till 3 plus. 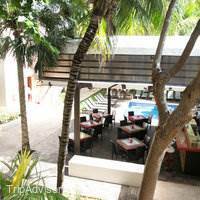 We stayed in this hotel just one night because of a late arrival in Cancun. 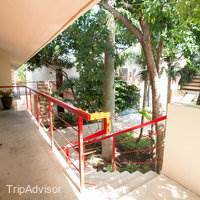 The hotel is conveniently located close to nice spots in Cancun. The hotel itself is very nice, nice employees, nice rooms. Would definitely recommend this hotel! Great hotel run by incompetent fools. 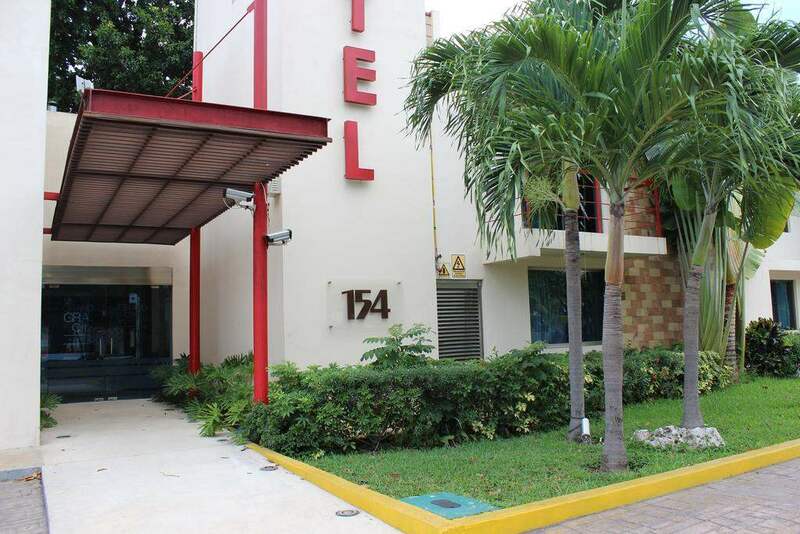 The hotel is really nice and at a great price and location near downtown Cancun. Its not in the bad part of downtown. Good pool, beds, and the hotel is well kept. Unfortunately the Air conditioner was very weak. We had to move to another room at 2am which was also steaming hot. We woke up drenched in sweat. The workers did not care. The office was freezing while our poor souls suffered. We left after one night. Maybe it was just those two rooms? I guess you can roll the dice. I first want to thank Mosses. He was the night security guard because of him I am writing this now. He was so nice and helpful. Made us feel at home. I could see that the staff also worked well with him. Our room was amazing it had a microwave, small refrigerator. The breakfast was not the worst or the best but the lady working went over the top for us. Clean rooms. Easy to get to all the market around there. budget lodging for a last minute trip. The staff was friendly at all times. on day one when i walked into the lobby i was greeted by name before i even introduced myself. Check in was a breeze and took less than 2 minutes. The rooms were pretty nice as well. They were clean and had air conditioning, a fridge and a microwave. what more do you need. 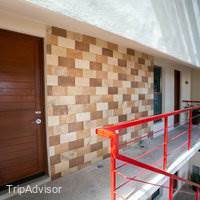 If you are looking for a lavish luxury room then this hotel is not for you. I booked the Jr Suite and while the room was nice, it was just a fancy name for a double bed room. Only bad part about the room is there seemed to be a plumbing issue. The toilet never got clogged but you did have to flush about 3 times and the water pressure in the shower could have been better. Its not really a big hotel so i felt like i was at a private resort. when i was laying out by the pool my friend and i were the only people there. i think i counted about 10 -15 rooms total in the hotel.The Grand city hotel is in a decent location. there is a bar next door and just down the street is a market place where you can get the best quesadillas ever! 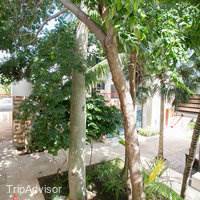 It is NOT next to a beach however so you will have to take a cab or drive a rental car. 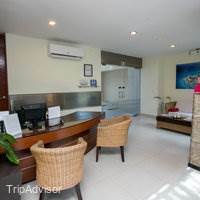 its about 2 min from the airport and about 20 minutes from hotel zone and the nearest public beach.Overall i liked the hotel. its kind of a no frills hotel. 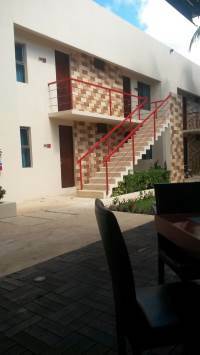 It looks nice and it is clean and has a heated outdoor pool, but you are not going to be doing anything there besides sleeping.. if you need a clean place to stay with friendly staff and dont mind driving a little ways to the beach and touristy areas then this place is right for you. if you are looking for a resort style all inclusive situation then you will not like this hotel at all.. of and walmart is like a block away. also there was a area outside that looked like a bar but im not sure if it was or not... there was never anyone there and i didnt see a kitchen so i dont think they serve food. Great hotel, the rooms were huge and comfortable. 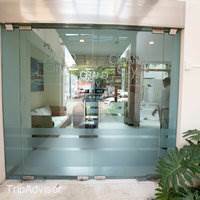 The staff are very welcoming, and even the ones that dont speak great English try their hardest and its noted. The rooms are a good size, the wifi works will in certain areas, and is free.We had no noise issues with the rock bar next door.Only slight issue is that its a bit far away from the Hotel Zone, a taxi costing somewhere between 150-250 pesos. But other than that is a little gem. 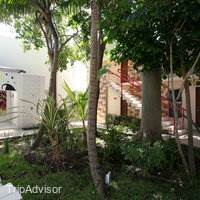 We stayed here for a single night, arriving late from New York and on our way to Tulum. The guy at the front desk seemed to double as both security and receptionist. He didn't speak English, but we got by and solved the check-in process. Our room was on the second floor (European first floor) facing the road. The road itself doesn't seem overly busy, so no noise issues. There was a very loud rock concert going on at a small venue right next to the hotel - and they went on into the night.Although there's plenty of space, a balcony (not furnished) and a seating area (tiny 'couch') it didn't feel cozy or like a place I'd stay for more than a few nights. The beds are rock hard, a bit too hard for my taste.The area around the pool and outside lounge looked nice, but we had no time to take a closer look - as we did not have the time to try the breakfast included before leaving for the bus station and Tulum (a 20 min walk and then a 2 1/2 our bus ride). 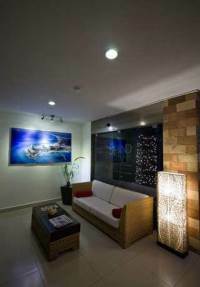 We stayed at this very nice hotel in Downtown Cancun for 6 nights earlier this month. We thoroughly enjoyed our stay here. 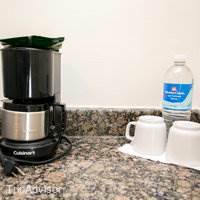 The hotel is conveniently located on a not so busy side street and within easy walking distance to bus stops, Walmart, Sam's Club and some nice Mexican restaurants and fast food chains. 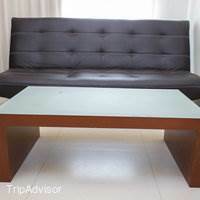 The rooms were large, spotlessly clean, and had a nice sitting area with a sofa and table, and also had a refrigerator, microwave and coffee maker. The beds were comfortable. 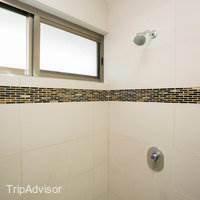 The bathrooms were fair sized with a shower and en-suite facilities and included toiletries. The included breakfast had limited choices, between a fruit plate and what they called a continental breakfast - baked beans (in a paste form), scrambled eggs with ham, 2 slices of toast and butter and jam. You could choose between fresh orange juice or coffee. 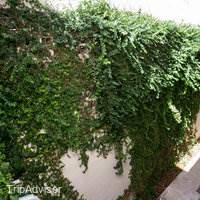 We loved this place most of all, because of the people who worked at the hotel> Every one of them was very friendly and courteous. 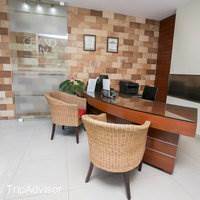 Elise at the front desk spoke very good English and should be complemented for the efficient manner in which she managed affairs. Anna and her friend who served breakfast also need a special mention. Moses at the reception , although a very nice and extremely helpful person, could do better if he spoke English! All in all, we would give this budget stay a very high rating! Nice and clean hotel with friendly staffs. 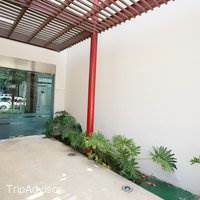 The room is big and clean, the surrounding area is safe, and the staffs are very friendly, and always with smile on their face. Complimentary breakfast is good. The only thing bothers me is the bar next to the hotel, they play very loud music until midnight, very noisy. Nice hotel in the wrong area! OK, so I read the reviews about this hotel prior to booking so knew about the noisy bar next door. For I didn't think it wouldn't be an issue as thought we would be back late each evening so wouldn't effect us. Unfortunately a bout of food poisoning and other issues kept us in and in bed early. So first the negatives. The noise caused an issue. It is noisy from around 9PM through to 2.30AM. Very loud rock music. We were in room 204 next to reception. I had to use my earplugs. If you are an average or light sleeper DO NOT BOOK a room here. My partner is a heavy sleeper and even he heard the music. Second negative is the area isn't great really if you like to be on top of things. For us this isn't an issue, but for some it could be. Lastly the pool is very small. So now the good stuff. Its a modern clean hotel. Spotlessly clean actually. We had a large room/suite. 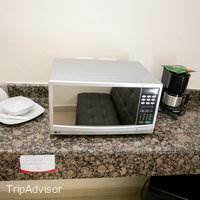 It had a microwave with plates/bowls and plastic cutlery. Large TV with English channels. Blackout curtains. Super fast internet. Free water daily. Free coffee daily. Free breakfast (modest). Close to the bus stop to get to hotel zone/beaches. 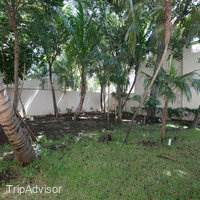 Close to Plaza Del Americas shopping centre. Close to Walmart (both walking distance of 10 mins). Put this hotel in another location and its 5 stars. But the bar next door really does cause an issue I believe. We stayed there for 2 nights. It was beautiful and clean. The personnel is helpful and friendly. 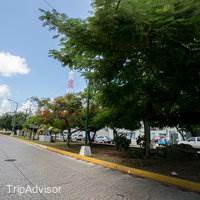 A bus is driving from the burger king (on the opposite of the hotel) to the grand porto where you can take the ferry to isla mujeres.Only 1 point minus because it can be quite loud during the night. There is a rock bar next to the hotel and they are playing rock music the whole night. It depends on the day - sometimes it's really loud and sometimes it's fine. We used ear plugs so it wasn't such an issue for us. Rooms and building have a kind of modern look even if not the most modern. The mattresses are firm. The pool is nice shaded by coconut trees. food is ok. The staff is kind and accommodating. Enjoyed my stay. Dont be swayed by the cheap price. There is a reason. You will never go to sleep. There is a bar right next to the hotel that has a band that plays screaming loud music until all hours of the night. So loud it sounds like it is in your room. We stayed here with our two children on a Sunday night as we had a flight out on Monday and thought the price was right and it looked nice. The band played until after 3AM. Sleep was impossible and it made for an even longer travel day considering we were up all night. The hotel itself is very nice. 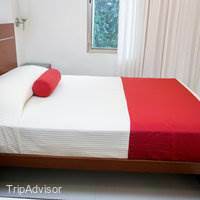 The rooms are big and clean, the bathroom is modern and nice, the beds are comfortable and the price is good. If the bar was not there I would give this hotel a great rating for the price but it is impossible to give it anything but a 1. 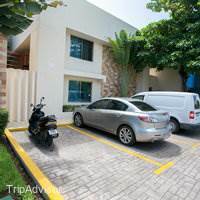 We chose the hotel for a one night stop over with its good value, low cost price as Cancun hotel zone rates were out of our budget. 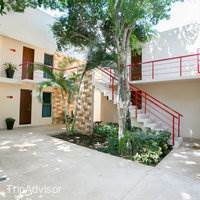 Located in the business area you can easily jump on the R2 bus outside Walmart and for $1 you can ride the hotel zone strip to beautiful Playa Delfines.Modern rooms are really well equipped, fridge, microwave, massive showers. Good wifi, free continental breakfast and free parking right in front of the hotel. Staff are really lovely and its such a shame that the rock bar is located near to this hotel as it's noisy until about 2pm. Any more than one night and this could be a problem for you if you like to get a good sleep. 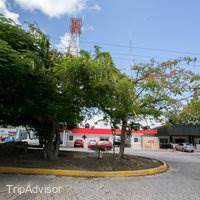 Booked this hotel before heading out to cancun as it was fairly cheap and decent rating. arriving in the evening it was the exactly what I needed to set up for my later travels; a large room, nice and clean, with a decent courtyard. I didnt have the breakfast option as the super market was a 20 minute round trip and there were enough equipment in the room to make a salad and a nice sandwich. 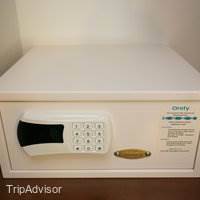 would definately recomend this hotel, if your looking for safe, cheap, friendly place. Only issue would be the biker bar two buildings down, the band played till i guess around 1-2ish, didnt really bother me that much but if your a sensitive sleeper maybe bring some earplugs. Stayed for a few nights with two friends, lovely hotel. The staff are very friendly and helped us whenever we needed some information. 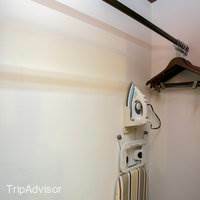 So I guess the main things:1) rooms are lovely, clean towels every day and room left immaculate. 2) Close enough to a rock cafe so can be some noise (never a problem for me)3) the R2 bus stop is ~50 meters away and for 10.50 pasos you can get to anywhere along the hotel strip. 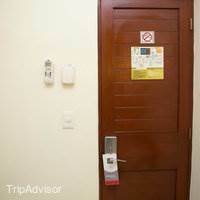 4) good wifi 5) area around the hotel is safe, we walked all around and we never felt in anyway unsafe. 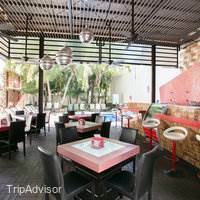 6) it's a 10 minute walk to Peters resturant which is the best restaurant in Cancun according to tripadvisor, I ate there and can't argue with the rating. I read the comments on the hotel abput the loud noise untill late night, but I was told by the reception that this was the free night of the club so there was no party and no noise this night that we stayed there, so i cant reallt tell about it. ABOUT THE ROOM ITSELF: excellent , very big and clean.High level.The hotel a little bit far from hotel zone but you cant take the bus near by. The satff is very nice and helpful. The breakfast included is simple and nice as well. Attentive and helpful staff; not the Ritz but not the Ritz prices either! Choose a room on opposite side of hotel from hotel side adjoining nightclub -loud and goes on until 3AM!. Not on the "strip" but bus runs to/from the "hoteleria zone" every few minutes. Running hot water varies in availability... usually just "warm". WIFI is inconsistent. Good option for 1 night. We stayed at this hotel for one night a few days ago...just in between flights. The room was very good, big, clean and comfortable. 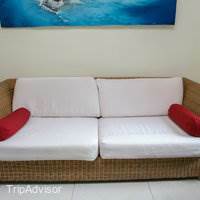 The staff was very friendly and the price was good for Cancun. Nothing more, nothing less! I'm glad I found this option! 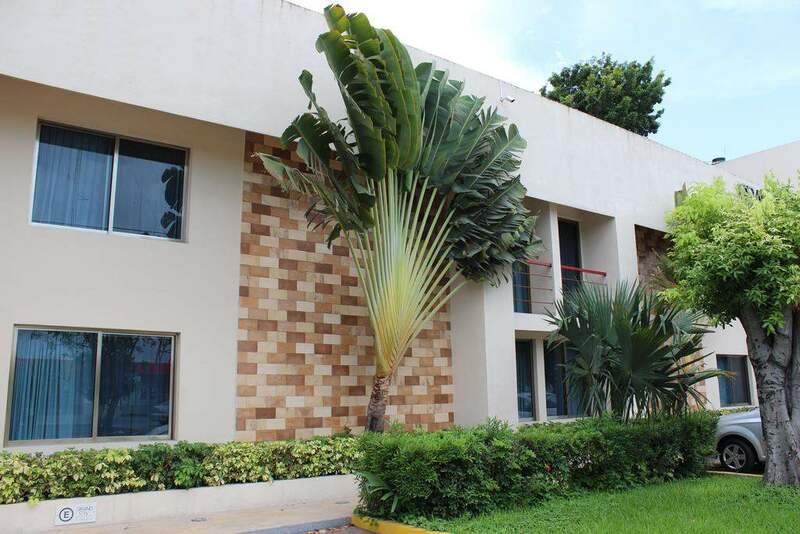 The hotel is clean, quite modern and has all the facilities you can expect for the price. 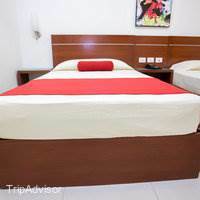 The rooms are spacious and the bed decently comfortable. Service was friendly and helpful. To get around, a bus stops very close which only charges 10 Pesos for a ride to the Zona Hotelera. It is also close to the ADO station (30 Pesos taxi ride) which allows for a cheap transfer to the airport. 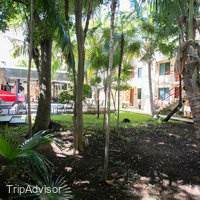 We stayed in the hotel for one night as our flight was in the morning and we had stayed in Tulum before. For that purpose the hotel is perfect! I can only recommend the hotel if you don’t intend to sleep there! We were supposed to stay at the Grand City Hotel for two nights in early April but left the hotel before the end of day 1.My overall experience was that the staff were only interested in our best – our money – but obviously not in making their guests welcome in any way. 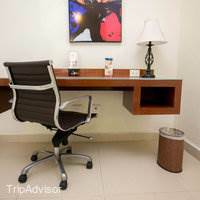 Neither it was possible for us to move into our room not only one minute before the actual check in time at 3.00 pm, nor did the staff have any desire to answer our request for directions to the beach and later for a nice place to have dinner in a helpful manner. 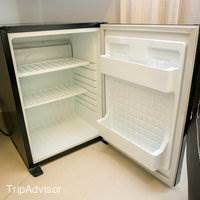 At least we were happy with the main thing, the room itself, as it was clean, spacious and modern and even being equipped with a small refrigerator. On the way back from the restaurant where we were having dinner we could already hear the music or let’s rather say heavy metal noise coming from the Highway 666 to hell (as it suitable name is) bikers bar, which is in close proximity to the Grand City Hotel while walking streets away from the hotel! Since the hotel seemed to be fairly modern we were hoping to have a sound proof room, but I this hope has been disappointed upon arrival back in the room.... It is fair to say that it was that loud to gain the impression that the band was playing in our room!Since it was very obvious that we would not be able to get some sleep if this musical performance carries on, we asked at the reception, this time was a different person on duty who did not speak English, and with help of google translation and the little of Spanish we speak we soon learned that the noise will last until 3.00 am!! 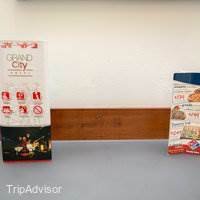 We were pretty upset as the primary purpose of a hotel for us is having a place to sleep and the Grand City Hotel could not offer that on the night in question. We had an early start ahead and needed some sleep, so we requested a different room as our room was the nearest to this terrible bikers bar. It did not come as a surprise that this request has been denied. After us persistently refusing to stay in this room as it was even too noisy to have a conversation, let alone sleep, we demanded our money back as knowing that not every guest might enjoy loud music until late night the hotel charges upfront.... Also this request was denied and after a long dispute we got suddenly offered another room which was unfortunately nearly as noisy. By then we saw ourselves forced to look for another hotel, which was not easy this late night. After finding a better accommodation we left at around 1 am and without a refund from Grand City. 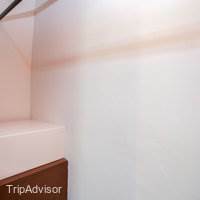 We also have never received any reaction from the hotel to our early check out, leave alone an apology or at least partial refund as a gesture of goodwill. To be honest, I don’t consider this hotel overly cheap, as they advertise their rates without general and city taxes of in total 14 percent, which can be misleading. 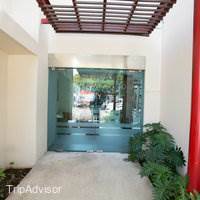 We paid 256 USD for two nights which equivalents to 152 GBP / 76 GBP per night and for that price I would expect a place where it is possible to get some sleep! We booked to stay at the Grand City Hotel for two nights in early April. 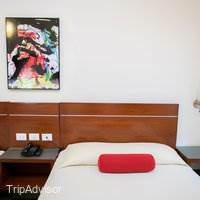 We found it slightly strange that when checking in, the staff requested we pay for the room up front but we soon found out why....When we arrived we were impressed with the room which was modern and spacious. 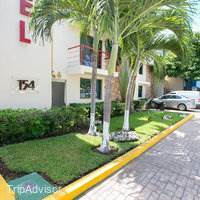 The hotel suited us as we were only in Cancun for an all day excursion and also to begin a road trip through Mexico, therefore a Downtown location seemed a better option than staying in the Hotel zone area. We arrived at approx 2pm which was one hour before the 3pm check in time. Unfortunately it was not possible for us to access the room even 1 minute before 3pm which was a shame but not the end of the world so we waited the hour until the room was available. After checking in we decided to pay the beach a quick visit. We asked the receptionist on duty for directions and were fobbed off that the bus stop is 20 meters down the road. We pretty much had to figure out ourselves that it were a few minutes to the bus stop, we were not sure where to get off and realised later that the bus stop on the way back was a few streets away from where we got on. Actual helpful information would have been highly appreciated. 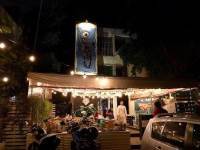 After going out nearby for dinner we returned to our accommodation at around 11.00 pm, streets away we could already hear the music aka noise coming from the Highway 666 bikers bar which is situated a few doors down from the hotel. At least we did not get lost anymore as we just needed to follow the noise. We were just hoping that the room was soundproof but this hope died shortly and we had the impression that the band played in our room as it was so loud! We went to the receptionist, this time a different person who did not speak English, and with help of google translation and the little of Spanish we speak we soon learned that the musical performance will last until 3.00 am!! We were pretty upset by this news as we had an early start ahead and needed some sleep, our request for first another room (ours was the closest to this terrible bar) was denied. We refused to stay in this room as it was even too noisy to have a conversation, let alone sleep so we demanded our money back. We were told that this was not possible, after a long dispute we got offered another room which was unfortunately no better :( At this stage we were had to go and search for another hotel at 1am and without a refund from Grand City. As this hotel is fairly cheap ($80 per night) I would say that if it was not for the deafening music then this is a reasonable and worthwhile option. Unfortunately due to our experience though, I wouldn't stay here again even if they paid us! 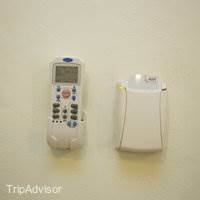 This is the perfect hotel when you have a tay or two layover between flights. 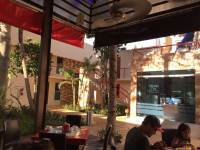 In a commercial area of Cancun, the hotel is a wonderful place to hangout. Nice rooms, free WiFi. A small pool, Wonderful, helpful front desk. 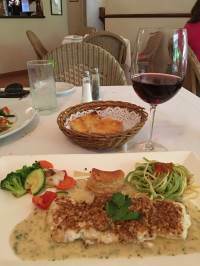 Walkable distance to truly memorable dining. 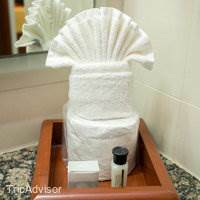 Ask at the front desk for recommendations. 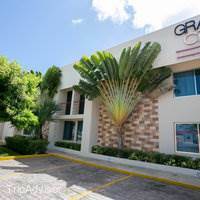 For the price, the Grand City hotel is actually a pretty decent hotel close to everything in downtown Cancun (there's a Walmart across the street) and a few blocks from Avenidad Tulum. 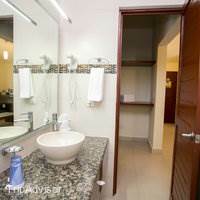 The rooms are very clean and quite large. 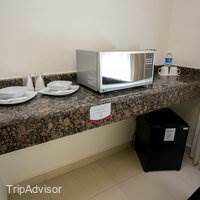 AC, flat screen TV, wifi and a free continental breakfast are provided. There's also a small pool in the courtyard. The staff is very friendly and helpful. The only problem with this hotel is that staying there is like playing Russian roulette....There's a biker bar just down the street. 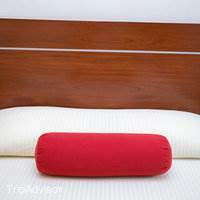 Some nights, there is very LOUD music...making sleep impossible before 2AM, some nights, everything is very quiet.... Sooooo, if you're planning to stay at the Grand City, bring a pair of ear plugs! We found the Grand City Hotel very clean and well maintained. 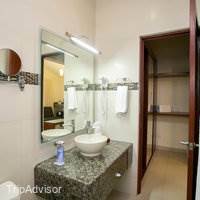 The rooms are very spacious and the bathrooms are also a good size with everything you could want. The pool is small but it is also a short walk to the ocean which we prefere anyway. There were some late night noisy bars next door but we were not bothered by them during the week were were there. 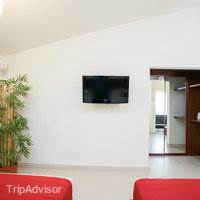 The staff were very friendly and helpful and we had no language issues at all. 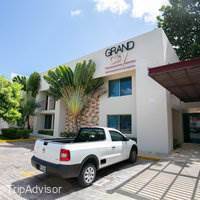 As stated in one of the reviews the Grand City Hotel is a perfect low budget option for Cancun. 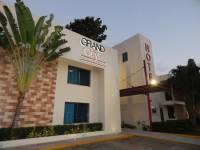 The Grand City Hotel is the perfect low budget option for Cancun. 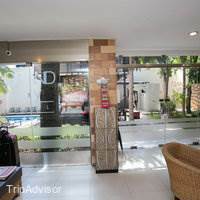 The hotel is new, the rooms are big and well furnished (including microwave, coffee machine, small fridge), they look nice and everything (inside and outside around the pool) looks very clean. We had a car and everything was easy to reach. As I mentioned in the title it was almost perfect: the only problem is the loud bar at the end of the street playing live hard rock music every night till 2 am. Nevertheless we would go back!! This is a hotel in the city that has been wonderfully maintained/renovated. 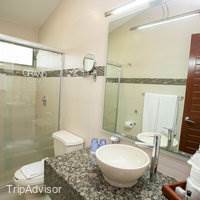 Rooms are large, spotlessly clean, with large clean, well appointed bathrooms. It is important to realize that this is not a resort hotel on the beach. 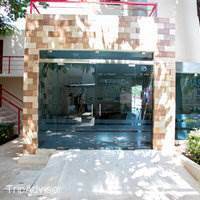 It does have a small swimming pool and a small, clean indoor/outdoor cafe.My wife and I do not speak Spanish. There was always a bilingual person at the desk who was quick to come and help us order at the cafe. The staff was uniformly pleasant and helpful. 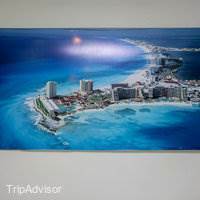 The desk was always friendly and willing to help us with directions and suggestions for local restaurants and shops.This would be our first choice for a layover stop in Cancun. We agree with all the positive reviews about the Grand City. 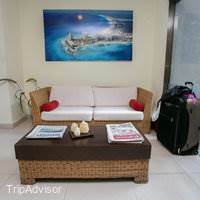 As long as you don't expect a Mega resort, or in the Hotel zone, this is an excellent choice in Cancun. 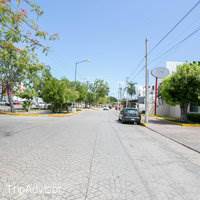 It is close to the Bus Depot if you are travelling within the Yucatan (we're returning from Merida) and is close to several small restaurants and a few bars. Our room was well-appointed and very clean, the wifi signal was strong, and the restaurant and small pool were clean and quiet. It is on a busy street, but we had very little traffics noise in our room. If you want a nice room for a layover before flying home, or want to be the Bus Depot, this is a good, economical choice. A modern hotel. That means large bathroom with hot and large stream of water, simple yet decent breakfast, internet access for free (although the signal isn't very strong, it just about works well enough), night time reception and a fridge. Stuff like the bus station and certainly the beach aren't very near bye, but the taxis are aplenty and very cheap (certainly after negotiating). There's a very loud, very popular bar on the street corner, which depending on your room location might get you up all night. Ask for the one farthest away if you come to sleep. Beds are quite hard but not uncomfortable. we stayed there for only one night and arrived after midnight, so didn't really get to use all of the amenities in the hotel. The room was quite spacious, clean and nice. And the location was great if you don't want to stay in the beach area. 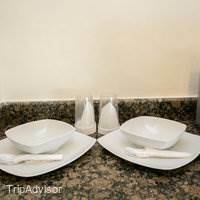 I have stayed in the Grand City Hotel twice, and both times have been very pleased with the cleanliness, service, and accommodating staff. The food in the little café is delicious - particularly the chicken enchiladas! The café shuts in the afternoon though, so you can't eat here in the evening.The hotel has a small pool, and the rooms are all round a little courtyard with the pool and trees, with loungers. It's all very contained, but very peaceful and relaxing. An ideal stop-over place if you have arrived at Cancun airport but are heading off elsewhere in Mexico (as we were). We wanted somewhere to stay overnight. We were not interested in the beach. This place was within walking distance of Market 47 (supposing you don't get lost) and of the old town center. The staff bent over backwards to help us with things like finding somewhere to eat, ordering taxis, drying our shoes etc. This was greatly appreciated.Our room was at the far end. It was so noisy during the night. It sounded like we were right next to a night-club with a band playing until the early hours of the morning. 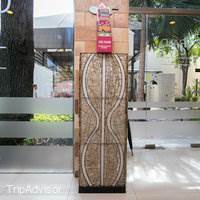 As long as you don't need the beach outside your room, you will enjoy your stay at the Grand City. The staff was great, the rooms were spacious. 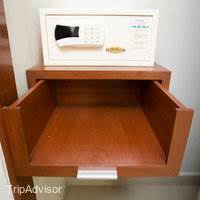 In the room was a microwave, safe and mini-refridge. Also a coffee machine. ( they provide the coffee and a bottle of water to make it). There are no elevators here but only two floors, so not a problem. The air worked great and the hot water was good. The only negative, sometimes it took a while for the water to get hot. Once it did, the shower was good. The bed was nice and firm, the room was very clean. There's a small pool and restaurant that I didn't try during my stay. Since the hotel is located downtown, I took the bus to the beach the two days it didn't rain. The bus stop is only half a block away. The Sam's club and walmart is one long block away. Many good eating places in downtown which I usually walked to, but if you need a taxi from the hotel, it was usually $30.00 mx anywhere downtown. 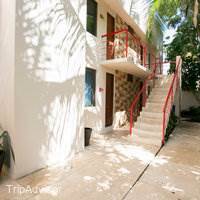 When I don't need the pampering of the resorts, this is where I'll stay in Cancun, at a 1/3 the cost of the resorts. 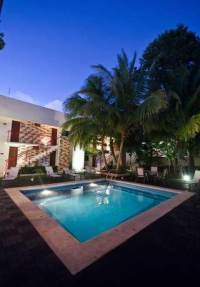 We stayed in this hotel for 3 nights while doing day-tours around yucatan. Very happy with the place, had everything we would have hoped for when booking it. We stayed in a junior suite, the room was basic but modern, spacious and clean. A bit noisy at times due to live music next door, but shouldn't have been a problem for other rooms as our one was the only room with windows facing out on the street. 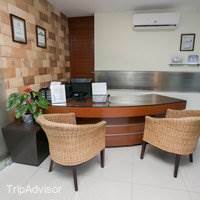 Staff were very friendly and helpful, some did not have much english but we always managed to get across what we needed.The hotel is located close to a lively downtown area, it feels safe but you won't see many holiday-makers around. Its fairly far from the main Kukulcan blvd, you'd need a taxi to get there.Grand city hotel has a tiny pool (looks bigger in the pictures), probably ok for a quick dip in the hot day but not really suitable for anything else. There is an outside bar area that was closed in June but opened up and served breakfast every morning. Food looked good but we would usually go to a nearest convenience store to get juices, yohgurts and pastries instead.Overall, good honest clean budget accommodation. 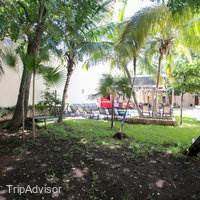 Not great for a long-term stay but a perfect harbour for a couple of days while exploring the yucatan. Stayed here for 14 nights in August with family inc 2 teenagers. 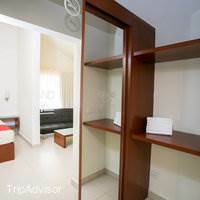 Pleasantly surprised to find such a spacious room at such a good price-we had to budget for accomodation after our planned visit stayng with friends fell through. Every member of staff at the hotel was pleasant, nothing was too much trouble. The manager was extremely hospitable, best customer service I have ever come across! Rooms cleaned daily, and extremely clean. There is a bikers' bar a few doors down, we popped in a couple of times as the music was right up our street. The noise from the bar didn't really affect our sleep as the air con was on each night which overrode the noise. Nice small pool which was a welcome dip at the end of the day, rarely anyone else using it. Had a great time here. Well done Grand City! Stopped here for one night after arriving in Mexico and before heading on a road trip, had a very pleasant experience. 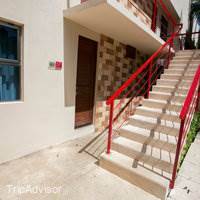 The hotel is around 5 minutes walk from central Cancun. Our room was clean, modern and very spacious, I believe we got upgraded to studio as we only booked a standard room, which was a nice surprise. There is also a small pool which offers a refreshing start to the day. 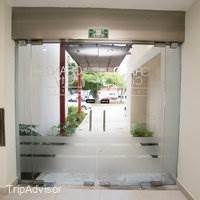 Staff were really helpful, we had accidentally locked our keys and rental details in the car and the gentleman at reception kindly found the necessary contact numbers, phoned the rental company and got them to bring us spare keys. Would definitely recommend for a short stop in central Cancun. Rooms are large and clean. 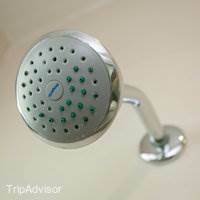 Bathroom smells every time you put the shower on. 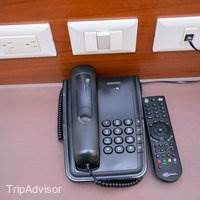 Hotel could not fix my room telephone to make local calls and a hotel suggestion company of renting a car never appeared. Breakfast is very limited and you have to buy extras. Very close to Walmart, there is a bar two houses down the road with live music every night but no problems. We stayed at Grand City for 3 nights total...2 at the beginning and 1 at the end of our trip. It wasn't the greatest welcome to the peninsula. It's an average hotel with all the amenities. 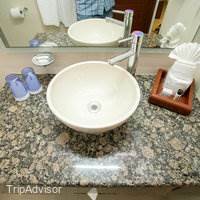 The bathroom was good but both our rooms had nearly clogged sink drains. The double beds were very uncomfortable. The 'outdoor pool and lounge' is a ghost town. We didn't see anyone out there using either one. We found ants in our room...I hate ants. And there is a terrible biker bar one building over. They have a live band every night that screeches music from 10pm to 2am. I had to use earphones just to fall asleep. But the staff is very nice and helpful. 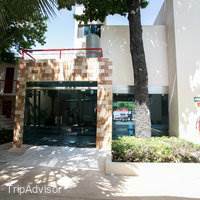 Really glad we picked this hotel, only stayed for one night after travelling from Tulum. 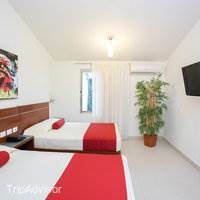 The hotel offers a great location which is only 10 mins walk to the centre of town with restaurants and bars.Rooms are comfortable with all mod cons. 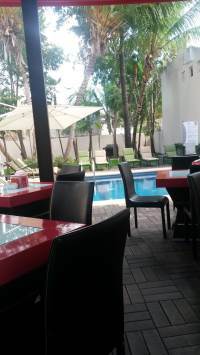 Lovely to have a dip in the pool, and good choice of breakfast offered.The Manager was very charming, he reminded me of a Mexican Simon Cowell !Good choice, and would stay here again. My husband and I stayed here in Feb. What a great place! Staff were helpful and friendly. Our room was spotless. 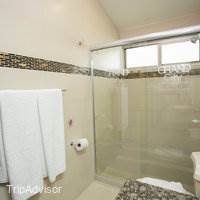 It is located within easy walking distance to Walmart, and local restaurants. Well worth the price. We enjoyed sitting outside in the courtyard.